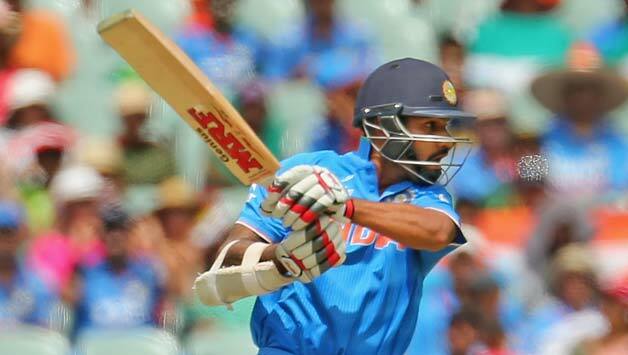 The return to form of Shikhar Dhawan will be a huge sigh of relief for the Indian camp. The one thing that the India-Pakistan game showed us was that if the bowlers bowl with pace and accuracy, you can cause lots of trouble to the batsmen on these wickets. The Indian bowling led by Mohammed Shami bowled with pace and aggression to dismiss the Pakistani batting line up for 224 runs thereby defending their total of 300 at the Adelaide oval last weekend. The Indian bowlers need to maintain that intensity throughout the tournament if they harbor any thoughts of getting close to defending their title. MS Dhoni though will be extremely pleased with the efforts of the top order batting. The batsmen except for Rohit showed excellent application and developed partnerships to get India to a good total. The one thing he would disappointed is the collapse in the final 5 overs which rendered India 25-30 runs short of what they could have achieved. Coming back to the Indian bowling, the combination India used against Pakistan might form the crux of the Indian attack for the world cup. Mohammed Shami will expected by Dhoni to lead the pace attack in the absence of Ishant Sharma. Dhoni will be hoping that he does what Zaheer did for India in 2011 world cup. Umesh Yadav, even though wayward, still bowled with lot of pace. He needs to work on his accuracy with the new ball. The other positive for India was the bowling of Mohit Sharma. Mohit bowled at the right pace and kept a good line throughout his spell. He was difficult to get away and was rewarded with two wickets for his efforts. The spin bowlers also came to party. Ravi Ashwin bowled really well and was clearly the best spinner on view in the first game. Ravi Jadeja looked rusty but his batting and fielding along with his accurate bowling almost makes him a certainty in the X1. The Indian X1 currently looks much more settled than the one which played the tri-series and the warm up games preceding the world cup. MS Dhoni and Duncan Fletcher will know that for India to progress in the world cup the bowling needs to click. The pace bowlers need to bowl well and keep the pressure on with the new ball. It is very important for India to stick to a combination and back their bowlers to deliver. The other heartening thing in the first game was Dhoni’s captaincy, which was brilliant and he was attacking throughout. The fielding also was fantastic and the Indians for sure looked much more ready for the world cup than the Pakistan team. The team combination looks settled and I don’t think that there is going to be many changes for the upcoming games. Ravi Ashwin and Stuart Binny might be playing musical chairs for the second all-rounder spot in the X1 based on the conditions. The batsmen coming back to form and the timely runs by Shikhar Dhawan means that India will breathe a sigh of relief as they don’t have to tinker with the batting order at the start of the world cup. India will now travel to MCG where they will take on South Africa who is one of the favorites like always. South Africa has explosive batting and great bowling attack. They are also one of the best fielding sides in the tournament. India would need to be at the top of their game to compete against a strong South African outfit. India would be hoping that their bowlers keep their good work going. The batting which is looking in good touch needs to fire and keep putting up good totals for the bowlers to defend. It will be an interesting game and India would be hoping to keep their winning form going. A win here against South Africa would be a huge confidence booster for a team who has had a nightmare series down under preceding the world cup. Well put! Even if the top order fails, we have the middle order batsmen in Raina and Rahane who are in their prime form and can accelerate the pace of the innings. The only concern here is Dhoni’s form and if that as well clicks, we know how destructive as a batsman he can be! Yes Roshan, Dhoni and Jadeja need to be in form for India. By the looks of it Jadeja will be India’s prime spin all rounder and he needs to fire with bat and ball. Dhoni will surely hit the straps at the later part of the tournament. We need to click as a team.